The books of Jim DeFilippi, JoAnne Brasil, Louelle Bryant and other BFB authors are available at their respective Amazon and Barnes & Noble shelves (See links below). Other books are available for free download. Jim DeFilippi is the BROWN FEDORA BOOKS CCO (Chief Coordinator). Perhaps Jim's most riveting book is JESUS BURNED, a crime novel based on the horrible UpStairs Lounge fire in New Orleans in 1973 (see below). In addition to numerous crime and humor books, Jim has also written THE MULES OF MONTE CASSINO, a strange non-fiction retelling of the grizzliest battle of World War II, originally written under the pseudonym of Henry Grif. ​Jim might very well be the most versatile author working today. He is at home in the world of crime fiction, literary fiction, humor, history, poetry and drama. He has even produced a cook book/exercise book (ERX: EAT RIGHT AND EXERCISE). BFB's most popular crime novel entry is JESUS BURNED, a novel which centers on the tragic UpStairs Lounge Fire, New Orleans, 1973. BFB was immensely proud when Jim DeFilippi’s PULP POETRY landed. A collection of thirty-five felonious poems, each in a different poetic form, along with an essay describing the history and structure of that form, and a prompt. An invaluable resource for every poetry lover, poetry teacher, poetry student, and laugh seeker. The book is available in both paperback and pixel (e-book) form. JoAnne Brasil is the latest writer to join the Brown Fedora Books stable. Her books have been praised by Publishers Weekly (“Brasil has written a brilliant story…”), as well as by Alice Walker, Gloria Steinham, Spalding Gray, and many others. JoAnne’s books are available in both pixel (e-book) and paper HERE. Click here to visit her website: The News In Advance. Louella Bryant has won numerous awards, including the Southwest Writers Award for Non-fiction. Her BROWN FEDORA BOOKS offering, FULL BLOOM, won the Premier Book Award for Best Work of Fiction. The paper and ink edition is also available from her website. know how fleeting love and life can be. Click here to get the e-book edition of FULL BLOOM. Jeanne Larsen is an award-winning novelist, poet, and translator whose work has been recognized with grants from the NEA, the Japan/U.S.A. Friendship Commission, the Virginia Commission of the Arts, and others. Her BROWN FEDORA BOOKS novel, SALLY PARADISO, is "part Barbara Kingsolver, part Gabriel Garcia-Marquez, part Lee Smith, with a dash of William Faulkner heading for Walden Pond in a red Toyota mini-truck." It’s a thought-provoking treat for book lovers, and it’s a laugh-out-loud delight. Tony Magistrale is Chairman of the English Department at the University of Vermont and the greatest of the Italian-American poets, as witness his prestigious Bordighera Poetry Prize and his works in publications like The Harvard review and Reflections. The poems in his BROWN FEDORA BOOK collection, THE LAST SOLDIERS OF LOVE, bring us to a football game in Buffalo, to a biergarten in Munich, to buying shoes at Barney’s in Manhattan, to watching school kids in Bavaria. 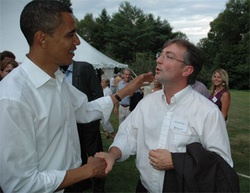 Philip Baruth (on the right) is more than a Renaissance man, he is an entire Renaissance posse-- professor (University of Vermont), novelist (The Ex-President, The Brothers Boswell), politician (Vermont State Senator), commentator (Vermont Public Radio), and award winning political blogger (Vermont Daily Briefing). His BROWN FEDORA BOOKS offering is SLED DOGS AND HEAVYWEIGHTS, a collection of the best from his blogs. The book will make you laugh, think, bubble in anger, and rethink the political views you’ve harbored since you first got hung up trying to slide closed that curtain on your first voting booth. The poems of Geof Hewitt (photo by Jeb Wallace-Brodeur) have appeared in Harper's Magazine and been featured on Garrison Keillor's Writers' Almanac. He is the reigning Vermont State Slam Poetry Champion and the great American poet Hayden Carruth said of BROWN FEDOR BOOKS collection, ONLY WHAT'S IMAGINED, "His poems are tough, sentimental, usually keen and caustic...vivacious, witty poems."